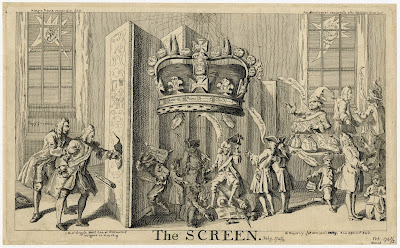 The Screen, artist unknown, 1742, British Museum. 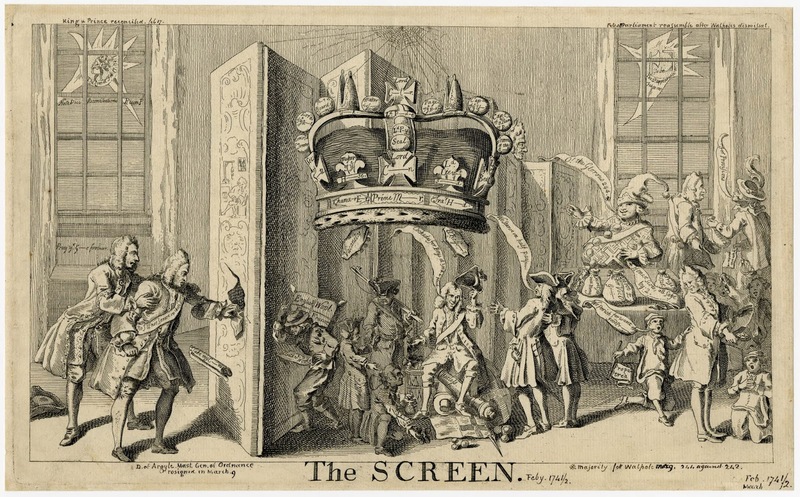 This dense political cartoon heralds the attempts of the Duke of Argyll to expose the corruption of Walpole and the King, by depicting him tearing at the thin screen that veils their transgressions. Among their offenses is the willingness to throw money at their supporters and frivolous causes, while neglecting those who mean the most to the Empire. 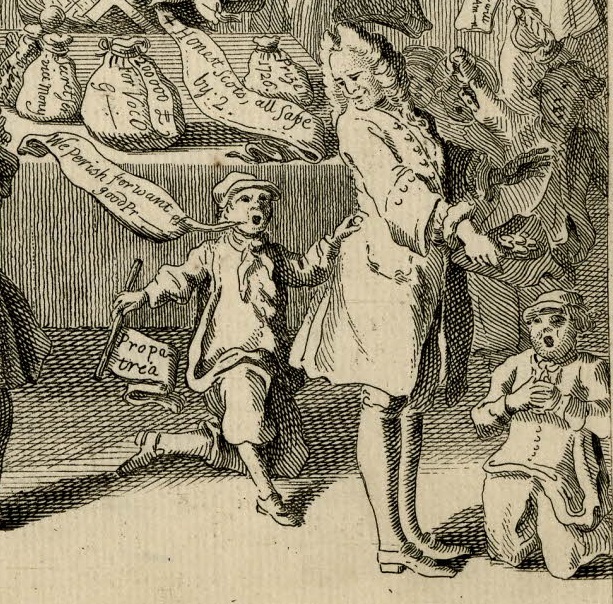 Sailors crowd around a gentleman whose hat is filled with coins, but he ignores their cries of "We Perish for want of good Pr[visions]." The sailor who clutches at the gentleman's coat holds a flag that reads "Propatrea," which may be a misspelling of the Latin Pro Patria, meaning "For the Fatherland." This is the same phrase used in Mosley's European Race for a Distance. Coming in the midst of the War of Jenkins' Ear, these sailors are essential to the protection of Britain's economy, the very gold that the corrupt politicians now hoard. The sailor on the right wears a cap with a narrow brim, a plain neckercheif bound around the collar of his smock, and a pair of trousers that end about mid-calf.These same trousers appear to be worn by the other sailors in the scene. Kneeling beside the gentleman and clasping his hands as he begs, another sailor wears virtually the same slop clothes, but wears a single breasted jacket with turned back cuffs. Behind him is another tar, this one hatless with unbuttoned slit cuffs and a single breasted jacket.